The first “hanging garden” of the Renaissance at Palazzo Piccolomini in Pienza, designed by Bernardo Rossellino in 1459 after the garden of Pliny described in Alberti’s De Re Aedificatoria, with gravel paths between four geometric flowerbeds bordered by double boxwood hedges and bay trees trimmed into cones and spheres and a central fountain. 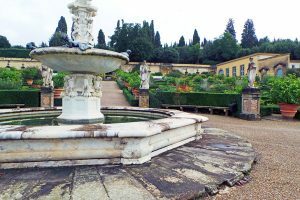 The classic Italian garden, also known as the Renaissance garden, was a new style of garden which emerged in the late 15th century at prosperous villas in Rome and Florence. Prior to this, Italian Medieval gardens had been inward looking, enclosed by walls and devoted to growing vegetables, fruits, and medicinal herbs (or for silent meditation and prayer in monastery gardens). 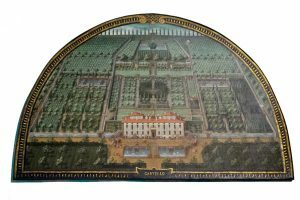 Lunette of the Villa di Castello estate as depicted by painter Justus Utens in 1599 with great lawn, fish ponds, gardens, cypress maze, Grotto of the Animals, and extensive orchards. 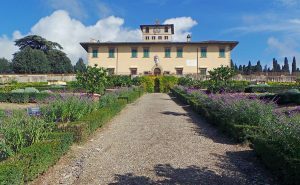 The Italian Renaissance garden broke down the wall between the garden, the house, and the landscape outside to look outward, both physically and intellectually, and was grown primarily for the purpose of pleasure, although edibles were included. It emerged from the rediscovery by Renaissance scholars of classical Roman models, inspired by classical ideals of order and beauty, and was intended for the pleasure of the view of the garden and the landscape beyond, for contemplation, and for the enjoyment of the sights, sounds and smells of the garden itself. Early Renaissance gardens were designed with tunnels of greenery, trees for shade, and an enclosed giardino segreto (secret garden). By middle of the 16th century, magnificence came to be perceived as a virtue, and the gardens became larger, grander and more symmetrical, filled with fountains, statues, grottoes, pools, and other features as the Medicis and other wealthy families and individuals constructed gardens to demonstrate their own power and magnificence to visitors — the garden was a form of political theater, presenting the power, wisdom, order, beauty and glory that the Medici had brought to Florence. Amphitheater of Boboli Gardens, Florence. 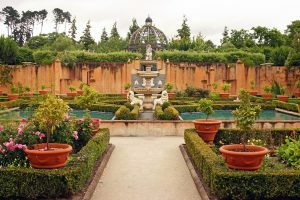 Italian Renaissance Garden at Hamilton Gardens, New Zealand. 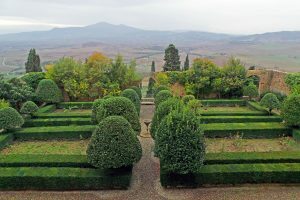 Traditional Italian gardens are formal in design, with symmetrical, geometric beds in squares, rectangles or triangles, eschewing the curves and sweeps common to English borders. The villa is treated as a feature of the garden, usually the central view, but the view from the windows and doors of the villa is just as important. Order and balance are the design goals, illustrating man’s power over nature. The plants manicured into geometric hedges or topiaries (plants shaped, trimmed and pruned into amusing shapes) are evergreens, so the predominant color is green — although the foliage of the shrubs or trees comes in a wide array of shades from light to dark green, as well as some in silver, bronze, or gold. 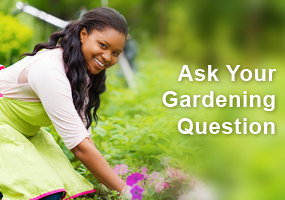 Evergreen plants of a variety of shades of green, silver, bronze or gold are manicured into geometric shapes. Boxwood (Buxus spp. ), Italian cypress (Cupressus sempervirens), laurel, yew, rosemary, and junipers are some of the most common species. These plants are also used to delineate garden rooms — each with its own special view — and serve as a backdrop for statues and fountains. 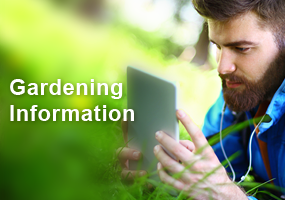 Of course this requires a lot of labor to maintain the precise shapes of plants that want to keep growing in a more natural form! 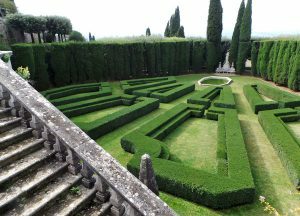 Maintaining the precise, geometric shapes of the plants in Italian gardens requires frequent shearing. Since the garden is considered an extension of the home, it is decorated in the same manner, with plenty of humorous or graceful art. Sculptures of Roman gods, goddesses and heroes of ancient legends are common. Statues of gods and heroes (L to RC at Boboli Gardens) are common, with animals, such as lions (R), less common. Lemon trees in terra cotta pots are a common decoration for the patio or seating areas, and larger collections of citrus are often set out on lawns for the growing season (and are moved into purpose-built limonaie (lemon houses; singular = limonaia when the weather turns cold as they are not frost hardy). Citrus trees in terra cotta pots at Giardino di Castello (L), Villa Vico Bella (LC), Villa Gamberaia (RC), and with MGV Sue R. at Villa della Pertraia (R). Fruit trees are often trained as arches or over pergolas, or espaliered against a south-facing wall for early ripening of the fruit. 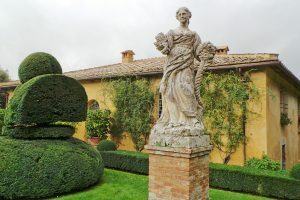 Italian gardens generally lack flowers; if they are included it is usually in bunches scattered in different areas or in densely planted beds surrounding a tall central plant or statue. Stone or gravel walkways, patios and walls are signature elements of the Italian garden, rather than the expansive lawns that English gardens include. Walls and other structures are frequently covered with trellised vines such as ivy, honeysuckle, or climbing roses, and pergolas, porticos and pavilions are draped with flowering climbers including wisteria or grapes. A wide gravel path leads up to Villa della Petraia. Villas were sited on hilltops in the countryside or slopes of a mountain, which not only provides exceptional views, but also cooling breezes and respite from malaria that occurred in the valleys (and unintendedly, isolation from the plague that decimated towns and cities below). Because of the sloped site, the gardens are laid out on several levels, or terraces, connected by paths and short flights of steps, offering places to enjoy the surrounding view as well as see the garden from above. The terraces divide the garden into rooms with varying “moods”. Looking down from the villa, the terraces should create an artistically sculpted view. There is always a promenade or formal pathway flanked by formally clipped hedges where a family or visitors may stroll both to see the garden and to be seen. Italian gardens contain a secret garden, an enclosed private space within the garden, inspired by the cloisters of Medieval monasteries — perhaps a vine-draped pergola or just a tucked-away bench — and often a grotto, an artificial cave filled with sculpture and sometimes furnishings. Looking down the baroque stairway from the Belvedere loggia at Giardino Bardini (L); looking down from the Romitorio toward the Villa at Villa Cetinale (LC); entering one of the garden rooms at Villa Vico Bello (RC); sculpture of Paris and Helen by Vincenzo de’ Rossi in the Great Grotto at Boboli Gardens (R). Central fountain in Giardino di Castello. Water in one form or another is also an essential element of the Italian garden in this hot climate. It may be just an ornate stone fountain that forms the focal point of the garden or a reflecting pool. But later in the Renaissance, improvements in hydrology meant that the gardens were equipped with increasingly elaborate and majestic cascades and fountains. The main function of the water was irrigation, but fountains, streams and ponds were introduced to create interest and enhance the beauty of the garden. Water features range from the large Isolotto (L) and Forcone Pool (LC) at Boboli Gardens, to the small pond at Villa Gamberaia (RC) and a stone basin filled with water lilies at Villa Vico Bella (R). The geometric garden at Villa La Foce. There is no single style Italian garden. The diverse regions of Italy influence the form and function of the gardens, shaped by climate, geography and history. Even contemporary gardens are influenced by Italian culture, thought and history. The perfect Italian garden would have a shaded space to sit and contemplate the efforts that have been taken to make this great green presentation. Italian gardens also influenced many other European styles of gardens, especially French and English gardens. I enjoy the use of geometry, but it seems to make the garden more high maintenance. I enjoyed the article and the photos. One of the nicest “formal” gardens I’ve been to in the US is Longwood Gardens in Pennsylvania. They have extensive topiaries and a very formal layout near their indoor greenhouse. I didn’t realize that the Italian garden design had influenced the French and English formal gardens. Although I prefer more informal layouts, there are elements of the formal garden that fun to incorporate, including sculptures and art pieces. Nice article…now I need to plan another trip to Italy to see more! Beautiful article. Often when I read a gardening article I think “I could do that”! Clearly these high maintenance gardens aren’t for the faint of heart, but they are beautiful. I found the fact that early property owners built on the hills to avoid plagues that hit people living the valleys interesting. Gardening on the terraces makes all of this trimming even more challenging. Whenever you think of English and French gardens, these sculpted and expansive gardens always come to mind. I would never want to maintain this type of garden – too much work, but they are beautiful to look at and admire. Imagine the amount of manpower that was needed to maintain gardens of this magnitude. 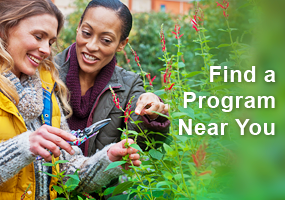 All work done without the use of power equipment or power lifts. Truely a love affair of greenery and man! These gardens are incredible. You would need an army to maintain them. I really enjoyed this article. As I have traveled to Europe and in France have seen gardens like this it brought back old memories. These garden take too much time for me to ever consider any little part of it, so much trimming. But I do enjoy the geometrics of the layouts, with everything being so perfect. It also shows how interesting an area can be with just being mostly green. I think sometimes people forget that there are so many shades of green. As an artist I am especially aware of that. Thanks for a nice article. I always thought it was the just English and French who had formal gardens. I didn’t know that bay trees would grow that far north.